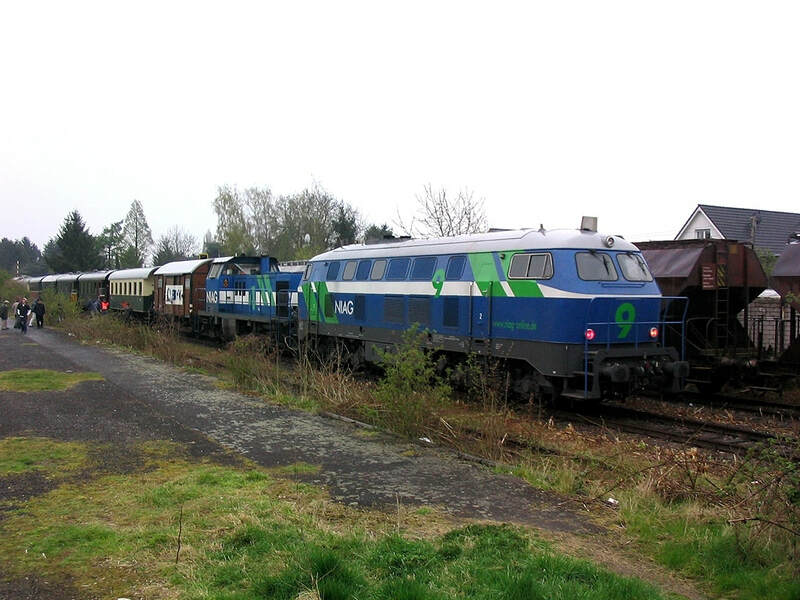 Back to Germany again, this time for a Mercia Charters railtour which was booked to fill in a particularly vexatious omission (due to closure) from Marienheide to Brügge, as well as a variety of other freight track. Oh all right then, it was just an excuse. I did want the track though, honest. A strenuous day, starting with a trip to the dentist in Wolvo then back home to collect a poorly daughter and drive her and our grandchildren down to Kent. Thence, courtesy of a lift to the station from a neighbour, to the station for the 1426 to Charing Cross as far as London Bridge, and the 1515 (about 10 late) to Luton. Swift ‘alf in a GBG listed free house (Beacon, pretty average) accompanied by a tedious clique of locals, then back to Luton Airport Parkway and the efficient bendy-bus link to the airport. Easyjet Airbus to Dortmund, no more than 3 minutes late. [My first encounter with ‘Air Stelios’, which I found perfectly acceptable]. Oddly, they use a tractor to push the aircraft on to the stands at Dortmund so they end up tail to terminal. 440 bus to Aplerbeck then U47 tram to Leopoldstrasse and a short walk to Hotel Drei Kronen which was English speaking and expecting me, which seems good enough to me! Only 6 hours kip due to the late arrival and early departure but at least it was comfortable and undisturbed. 0645 RE to Köln Hbf which, astonishingly, was diverted via the goods lines from Langendreer to Bochum, which the tour should be doing later. [It did]. Hordes of füssball fans at Do-Hbf (and some polizei) but no trouble at all. Mostly going to Berlin it seemed. Let’s hope FC Köln are at home. They must have been, as all was quiet at Köln. I went in search of breakfast at Kamp’s (no mayo – excellent!) and while I was finishing my coffee IM arrived. After getting further supplies we reconvened for the Mercia Charters tour, six surprisingly comfortable 4-wheelers with NIAG diesels fore (ex DB 216, no. 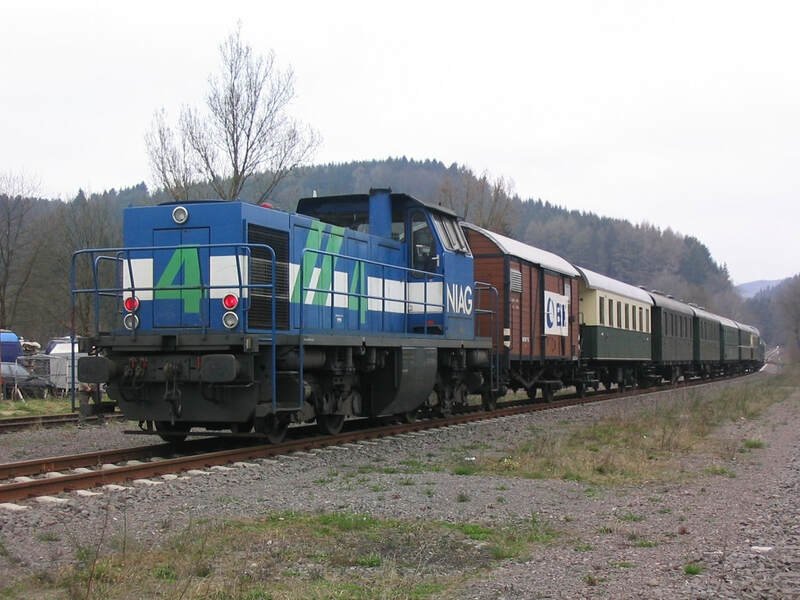 8) and aft (Vossloh no. 4). 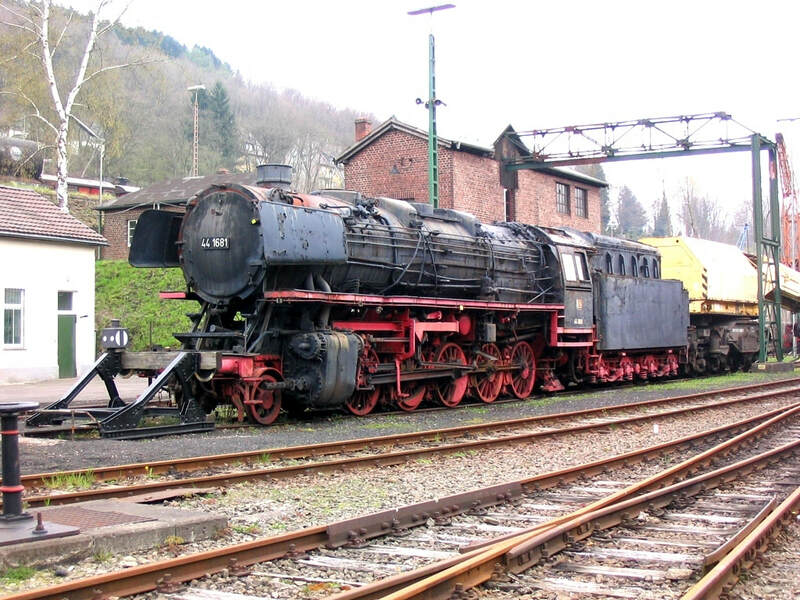 And so off up the Gummersbach line for the fourth time, this time stopping at Dieringhausen where three reversals were required to get us down the steep branch to the HSW museum depot for much photting of kettles etc. On over exceptionally valid track to Brügge, pausing to run down the Krummenerl branch which serves a quarry. We got as far as the former station, a few hundred metres short of the end. First glitch occurred after Hagen where we were booked to take the freight line via Wengern Ost but in fact we used the passenger line through to Witten, only reaching freight track again at Landengreer where we took the south to west curve on to the freight line which the RE used earlier. Then via the freight lines towards Bochum but turning right to go via Bochum Nord then straight on at Bo-Präsident to the single line via Gelsenkirchen-Wattenscheid to Bottrop Süd. Thence along the south side of Oberhausen-Osterfeld Süd yard and the south side of Oberhausen West yard and via the freight line across the Rhein to Moers, arriving somewhat late. Farce ensued, with the NIAG ‘depot visit’ consisted of standing in the rain watching 216 no. 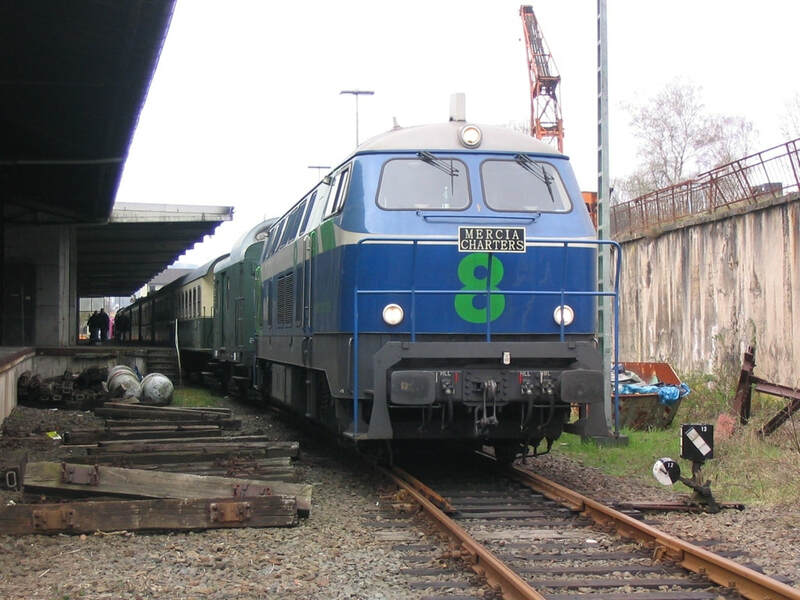 9 attached to the Vossloh. Then along the Vluyn branch and back, complete with numerous level crossings requiring a ‘stop and proceed slowly’. Around 90 minutes late leaving Moers, round via Duisburg Entenfang and on to Düsseldorf-Rath and Hilden more or less in daylight. Dark down to Opladen if we’re honest – en route we hit the moleworks which started at 2100, plus OHLE problems on the passenger lines. After a long wait north of Opladen for the single line we staggered on eventually, stopping almost 2 hours late at Köln-Deutz where I baled out hoping to just make 2223 to Ennepetal. Couldn’t see it on the board so I dived back on to the tour and settled for 2251 RE Köln Hbf-Dortmund Hbf. This arrived at Dortmund 12 late, pigging me off no end! 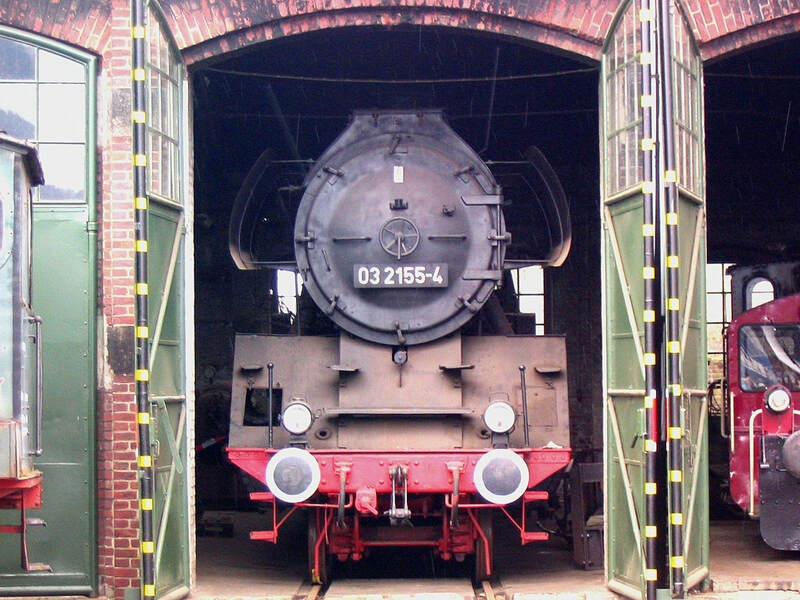 At the other end of the train, NIAG's Vossloh Bo-Bo no 4 waits at the former passenger station at Krummenerl. 6 hours later, up for a shower and a very presentable (and welcome) breakfast at the Drei Kronen. Made the 0850 U-Bahn instead of the planned 0920 – just as well. All went swimmingly until Aplerbeck where there was no timetable for the airport-bound 440 bus. I hung about hopefully for a while then saw the moleworks notice and realised I had a problem! Rushed about for a bit, finding the ‘ersatzhalt’ by deduction, and just 1 minute (no, probably 15 sec in reality) before the bus got there. And so to the airport – Easyjet were good again, arrived early from Budapest, departed on time, arrived on time at the hell which is Luton. 15 minute queue to be let back into my own country but still plenty of time before the 1220 VT99 bus to Milton Keynes, an excellent £4.50 worth. Arrived at MKC at 1320, checked the bus for tomorrow’s commute [I had the dubious pleasure of commuting from Telford to Newport Pagnell for the following 5 days] then in the station found everything back to the 1137 ‘delayed’. ‘Anything heading for Birmingham?’ quoth I to the booking office person. ‘Afraid we really don’t know’, quoth she. Headed for the platform to find the 1137 ‘expected 1325’. It appeared and stood a couple of signals away for some minutes, eventually rolling in at 1337. Fair enough, it was going to Wolvo and I’d expected to catch the 1337! Rolled out at 1339 (major signal problem, no trains out of EUS – mine was the last but one to escape) then stopped again at Wolverton. Finally got going 130 late, Coventry about 127 late. This was the 1248 from New Street – left there at 1442, a mere 114 late! I left it at Wolvo where it was held up and left 120 late on the dot – can’t help wondering if this was deliberate so that it would run in the path of the cancelled 1510 [no compensation then, see]. By contrast, ATW’s 158 forming 1526 to Shrewsbury turned up early and left on the dot of 1526. H was ready at Shifnal at 1547 which ended a generally satisfactory trip.